Ladies & Gents Golf on a Par in Derbyshire? I've been playing golf for the last 10 years at a variety of courses across Derbyshire and Cheshire, perhaps more social than competitive for most of it, but great fun none the less. For the last 8 years I've been playing Ladies golf in Derbyshire as a member of New Mills Golf Club just south of Stockport - a very down to earth club owned and managed by its members. 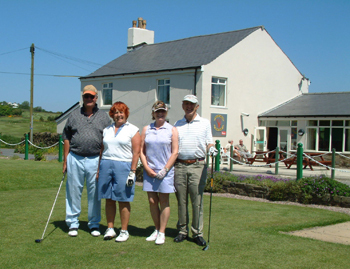 Thankfully, golf in Derbyshire more generally tends to keep the funny handshakes and stuffiness often associated with golf to a minimum, so a merger of the Ladies and Gents Golf Unions in Derbyshire comes as no surprise, albeit somewhat overdue. Prompted by the Equalities Act, the distinct membership categories for Ladies sections in Golf Clubs are beginning to disappear. Always an oddity that Ladies should not have equal playing rights alongside Gents for the prime time tee slots for Saturday competitions, or even the Sunday mornings was always tempered by the fact that Ladies paid less for their membership. This is all changing rapidly, not just in Derbyshire and definitely for the better, despite what a few old traditionalists of the Gents game may think. At New Mills Golf Club, we've just voted to unify the membership categories across the sexes, and for older members too for that matter. There remains a distinction from 5 day (weekday only) to 7 day members, plus some financial incentive for players who are younger. Yes I know, a lot of readers think golf is 'a good walk spoiled', but it really is so much more than a walk, and because of the handicapping system is a delightfully respectful sport. A very well worked out system of etiquette means that every aspect of the game has been considered to ensure that respect for opponents is embedded in all behaviours so that no advantage is achieved apart from how each player plays relative to their usual game. Having no personal desire to play in rain, snow or fog, I will always be the first to beat a hasty retreat to the club house at the merest mention of these words. But this is all part of the fun of the game. 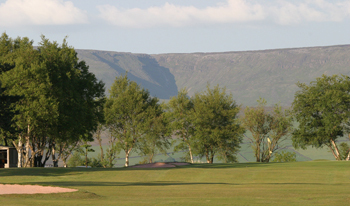 New Mills Golf Club is one of the most picturesque clubs in the Peak District - you can see as far as the Welsh Hills to the west, the Lancashire hills beyond Manchester to the north, and have stunning panoramic views of Kinder Scout and the High Peak to the east and south. This often helps on the days when the golf is not good, as the beauty of the scenery helps to calm the frustrations of playing a game that was surely invented to cause incredulity at how your game can go from good to appalling in 24hrs, and then back again. For those of you who have never been tempted to look at a golf course, never mind pick up a golf club, can I just say what a very stimulating game it is, and that you should give it a go - it's not as boring as much of the televised games might suggest. There is far more to it than just swinging a club (which often has plans of its’ own!! ), as you will need to adopt strategies to cope with the weather, temperature and general layout of the course, specific ground conditions, lie of the ball and possibly the situation of your partners. As a result, it can be as mentally challenging as a game of chess, where you are trying to outwit your opponent with every move. Despite the distinct membership categories of Ladies and Gents having been unified, the Ladies and Gents sections remain and will do for the short-term at least. Because of the handicapping system, golf is one the few physical sports that can be played on a level between Ladies and Gents, despite a great deal of difference between their respective games. Men at the club tend to send the ball greater distances, whereas you often find women play a much more accurate game, saving shots compared to the men. New Mills thankfully has a lot of mixed competitions, which lends to a good integration between the Gents and Ladies sections, though each section have plenty of their own 'board' competitions. Given the variety of competition formats between medals, stablefords, greensomes and texas scrambles, the integration of the game is surely going to increase apace. Perhaps though, the icing on the cake of being a member of a golf club in Derbyshire or Cheshire is the inter club competitions throughout the year, played at most of the local clubs. Usually this involves both a ‘home’ and ‘away’ fixture, providing a very cheap and friendly way to play a variety of courses around south Manchester and Derbyshire. It is fair to say that the days of plaid clad, unfriendly lady golfers have declined, as we are usually greeted with genuine friendliness by other clubs, and encouraged to enjoy their course and their hospitality. Although I think New Mills is the best course and club, each course in the region has its own challenges, picturesque holes and individual attractions like water features that mystically attract golf balls! 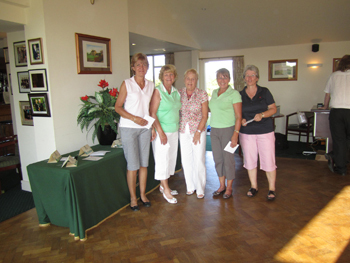 Apart from the golf, New Mills has a host of social functions to help extend the friendships made whilst playing golf. These have helped to reduce any historic barriers between Ladies and Gents sections and integrate all ages and sexes within the club. In some ways, and helped by excellent new bar and food managers John and Liz Longworth, the clubhouse is becoming a focal point for more than just golfers and is now something of a focal point for a quality social life around New Mills, especially as they are open to non members. Quite how the unification of membership categories, and increased focus of the clubhouse for quality nights out in the area, will work themselves out on attracting more women to the game, it surely must be the case that golf is going to get more of a profile in social life more broadly. It's already the case that golf has had some recent high profile appearances in the popular soaps such as Coronation Street, and as Bob Hope from Emmerdale has been seen running past New Mills Golf Club as he trains for his marathons, is it likely we'll be seeing a storyline of some Ladies from Emmerdale on the golf course? I think so, and not before time! Golf is no longer the privilege of the rich and the clubhouse the preserve of men, and a set of clubs can be bought for less than a night out, providing enjoyment and exercise, not to mention the friendships fostered by a shared frustration at the vagaries of the game, maybe it's time for more Ladies to take up the game in greater numbers than ever. It is true that the subscriptions can be frightening on first viewing, but if paid monthly, probably cost the equivalent of a good gym but for much more reward in hours usage, and long lasting friendships. From beginners to experienced players like myself, playing with others definitely helps improve our game, though lessons from Carl Cross, our Club Pro do help new players and experienced players alike, which I'll try and return to in my next review of how the game's developing.